A restaurant's location may be just as important as the food they serve. Cafecito nailed it on location with a close by hostel making up most of their patrons. This sandwich and coffee shop features Latin American style cuisine and is home to one of the most popular Cuban sandwiches in the city. When it comes to the prices, Cafecito is extremely reasonable. The portions are good-sized and they do not skimp on the ingredients. Some sandwiches even have three meats. Flavors are definitely there, but I felt the different sauces overwhelmed the entire sandwich. The service in my opinion was subpar with the line taking quite some time despite ordering ahead. For those reasons, I felt a 3.5 mile rating was fair. 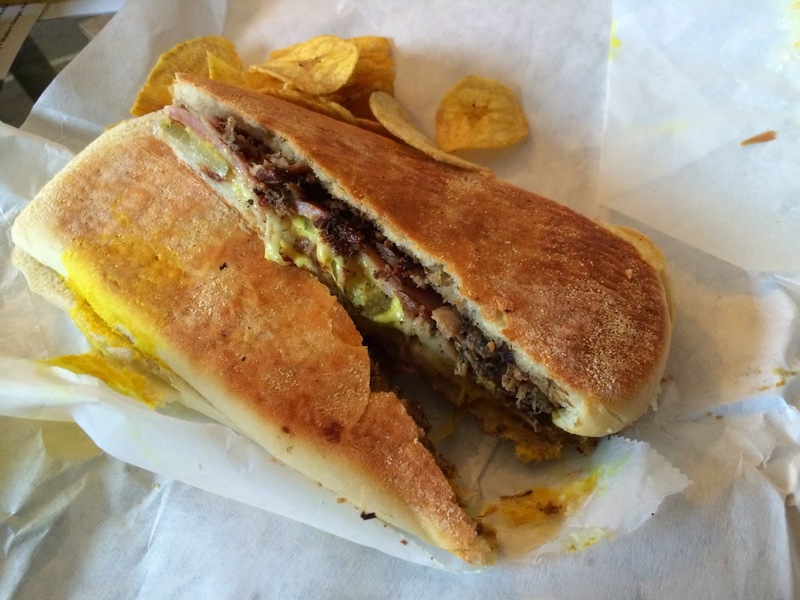 Cafecito makes a very classic Cuban sandwich. The bread roll is stuffed with roasted pork, slices of ham, swiss cheese, yellow mustard, and pickles. The entire sandwich is then pressed until crispy and flattened. On my first bite, I was surprised with the amount of meat in the sandwich. Most places cut you short whenever an additional meat is added, but here, that is not the case. What was overwhelming was that yellow mustard. They literally lathered the sandwich with it, which was a poor choice in my opinion. And, rather than using flat sandwich pickles, they stuck a couple pickle spears in the sandwich. This is the problem with some restaurants... they don't pay attention to the details. Each bite was either full mustard or pickle, which didn't allow the meats to shine. It is a good cuban, but I can't say its the best I have ever had. Our second sandwich we ordered was the Chivito. From the name, it is impossible to guess what is inside the sandwich. But this one had it all. A similar roll was filled with steak, ham, bacon, fried egg, mozzarella cheese, lettuce, tomato, onion, and a citrus mayo. 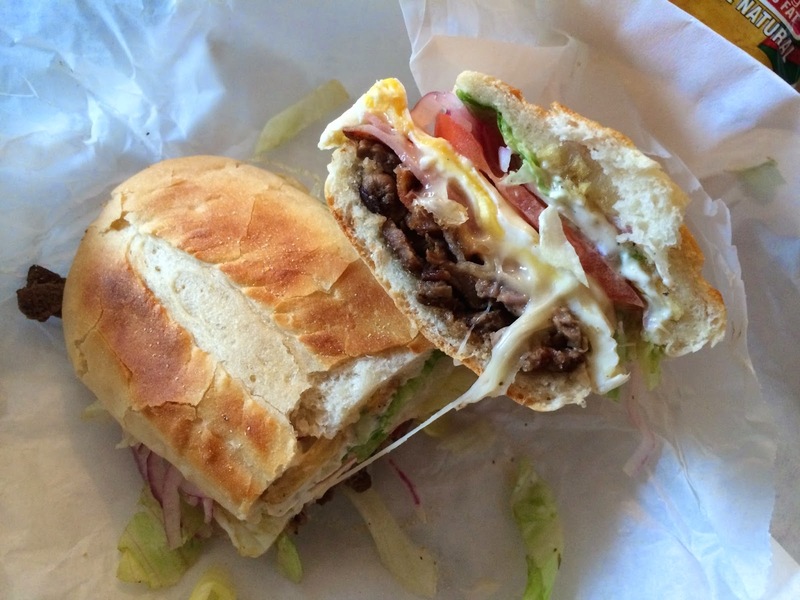 Just like the Cubano, it is pressed to give that crispy outer crust. I thought this sandwich was 10x better than the Cubano. Rather than overwhelming the meat, the citrus mayo acted like a creamy chimichurri sauce which complemented the steak very well. All the meat was tender and a nice richness was added by the fried egg. The addition of the vegetables gave a sense of freshness and cut some of that greasy edge. I would recommend this sandwich without reserve and will be back to give it another go. - Stick with the sandwiches. They are reasonably priced and tasty. I would avoid the chips like the plague. They were expensive and terrible. - Don't expect the fastest service here. With a lot of international students/tourists, the line can back up fairly fast and it takes quite a while to just place an order. I became insane, with long intervals of horrible sanity. See the link below for more info.